The Tasman Bridge was first opened to traffic in December 1964. The Tasman Bridge is not just a majestic structure. It serves a very important function. It connects Hobart CBD to the eastern shore of the River Derwent. I remember the first time I drove across the bridge. As I was approaching it, I noticed that it inclined upwards from either end so that the middle section was fairly higher than the rest of the bridge. I wondered why the bridge was built in this way. Why not build it in a straight line from end to end? The bridge's predecessor, the Hobart bridge, was actually built like this. There was a problem though. Whenever a water vessel needed to pass through, all traffic on the bridge had to stop so that part of the bridge could be raised. This made it possible for the water vessel to pass through. Unfortunately that did not happen on Sunday 5 January 1975. The bulk carrier Lake Illawarra collided with the bridge. Tragically, twelve people were killed. A new temporary bridge, the Bailey Bridge was constructed just north of the now broken bridge. This helped restore a direct road connection between Hobart and the eastern shore. Rebuilding of the actual bridge commenced in October 1975. The work took two years and cost around $44 million. The official opening of the new bridge took place on 8 October 1977. 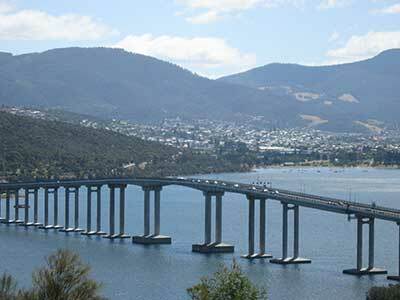 For more details regarding Hobart's famous bridge, go to the Parliament of Tasmania web page which features the Tasman Bridge statistics.